Season's greetings to you all on this cold winter's eve. Are you sitting comfortably? Let me tell you a tale of a house divided. A tale of controversy and dirty looks entering a once amicable abode. A tale of events so shocking that they rendered a happy community a place of ill-cheer. 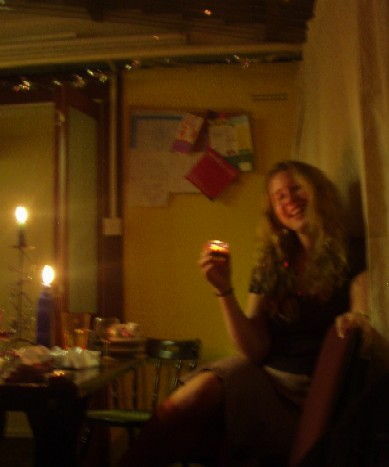 See, I like fairy lights. I will even go so far as to admit to an abnormal passion for the things. But look at them. How could you not love them. They shine and twinkle and they're happy happy little things of joy… ahem. Anyway, I accept, strange as it may be, that there are some people who would rather not have them as an all-year round sort of event. But t'is the season to be jolly, and so in an excess of goodwill and festive cheer two of us gaily strung up the lights one Sunday afternoon, to be met with scepticism and raised eyebrows from the other occupants. Tra-lalalala, indeed. Apparently they look tacky. But this is Christmas and tackiness is de rigeur, surely? Besides, we have the ugliest living room ceiling in the world (given that it is essentially corrugated plastic) and surely anything we can do to detract attention from the random nails and the kitchen paper stuffed up the slats to prevent leaks is good? Or so you would think. But apparently not. Apparently some prefer our apparently untacky plastic ceiling and obviously classy gobs of sodden kitchen roll. For a while, the feud wasn't too bad. Apart from the battle over the plug socket every evening (they're on, they're off, they're on again) for the most part, the fairy lights twinkled over happy faces, and in the multicoloured glow it was easy to avoid the pointed looks. But on the night of a howling storm, it almost turned ugly. The rain battered, and the wind whistled, and the plastic roof wobbled. And leaked. Very near the fairy lights. 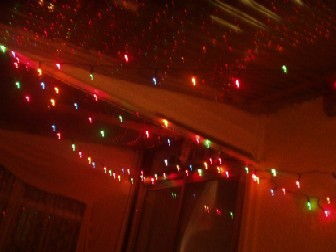 And somehow, during the frantic distribution of vital supplies to survive this calamity, the suggestion was mooted that maybe the fairy lights should be taken down altogether. And we stared at each other, and the wind howled about us, and the water dripped slowly between us. And we said nothing. And then the kitchen roll was raised again, and we continued to stuff the leaks, but we both knew that something had been changed by those words, and nothing, yes, nothing, would ever been the same again. How The Car Was Won And The Hubcap was Lost, The Miracle Of Cream Cheese in a Mince Pie, The Wonders of Actually Enjoyable Gainful Employment, Why Reading Diana Wynne Jones Books is Course-Related, and Staying On: the Extraordinary Story of a Student Trapped by her Christmas Job who must Remain in Leamington after all her Friends have Gone.